Details about NVIDIA's upcoming 28nm desktop GPUs were leaked by Asian tech site 4Gamer. The slide reveals NVIDIA's low-end parts (GK107) will arrive around Q2 2012, with mainstream parts (GK106) to follow by late Q2 2012 and a new high-end part (GK104) by mid-2012. 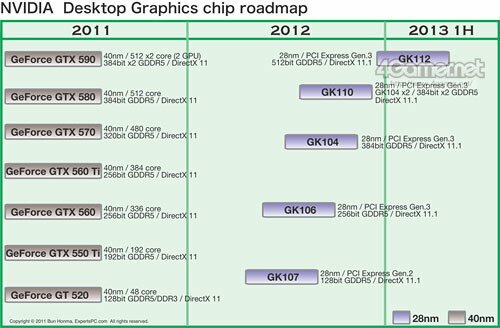 Shortly after that we can expect a new dual-GPU model (GK110), and a new massive die chip (GK112) is anticipated by the end of the year or early 2013. In 2012, NVIDIA is expected to embrace AMD's sweet-spot strategy, with no massive die. Instead, the top single GPU part will be GK104, featuring 384-bit 1.5 GB GDDR5 memory. GK104 is said to push out 2 TFLOPS, 30% higher than GTX 580. However, despite the smaller die, 4Gamer claims it consumes over 250W power. GK104 will release bang in the middle of 2012, perhaps during Computex time. Following right after GK104 will be GK110 - a dual GK104 flagship, thus completing NVIDIA's line-up for most of 2012 - remarkably similar to AMD's sweet spot strategy. However, not for long, as late in 2012 / early 2013, NVIDIA plans to return back to a massive die with GK112, featuring 512-bit memory.